The 2015 Chevrolet Trax offers versatility, connectivity and turbocharged performance in an efficient package. Sporty and modern, Trax blends small-car agility with the utility of an SUV, including up to 48.4 cubic feet of cargo space. 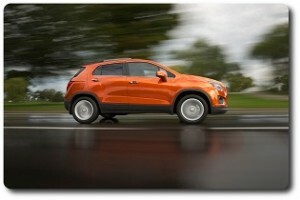 Trax accommodates customers’ increasingly connected lifestyles with available OnStar 4G LTE and built-in Wi-Fi hotspot, as well as MyLink technology with a 7-inch color touchscreen. With its signature dual-port grille, prominent bowtie emblem and swept headlamps, the Trax is immediately identifiable as a contemporary Chevrolet. Available cues such as front fog lamps and simulated front and rear skid plates lend a sportier presence, while vertical tail lamps flank the tailgate, accenting taught body lines and pronounced wheel arches that give the Trax a confident stance. Inside, Trax’s distinctive styling carries over to a dual-cockpit instrument panel. The instrument cluster is inspired by the bold design in the Sonic, featuring a large, performance-style analog tachometer combined with a prominent digital display for the speedometer and other readouts. A small-diameter, thick-rimmed steering wheel enhances the sporty ambience. For versatility, the 60/40 flat-folding rear seat features a fold-down armrest with cupholders, storage in all four doors, four bins in the dash, pockets in the seatbacks and bins under the rear load floor and a hidden storage drawer under the front passenger seat. Trax is powered by a power-dense Ecotec 1.4L turbocharged four-cylinder engine backed by an efficiency-enhancing six-speed automatic transmission. The engine is rated at 138 horsepower and 148 lb-ft of torque between 1,850 and 4,900 rpm. A six-speed automatic transmission with TAPShift control is matched with the 1.4L turbo engine. This entry was posted in Car Buying Research Starts Here, Chevrolet_. Bookmark the permalink.